For something so flimsy, disposable plastic baggies can really add up. But these durable, reusable silicone bags do the same job—and more—without any waste. stasher bags are made entirely of silicone. There’s no plastic in them—as well as no BPA, phthalates, and latex. And, unlike their plastic counterparts, these bags have way more uses. Just make sure to press the seal firmly and squeeze excess air from the bag to help close it up tight. They can go in the freezer, microwave, and dishwasher. They can even handle boiling water, so you could cook with one, too—sous vide, anyone? The pure platinum silicone is non-porous, so bacteria can’t grow, keeping food fresher. 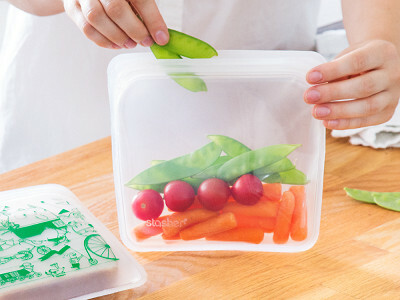 Besides snack duty, you can use a bag to store household odds and ends, or to keep toiletries mess-free on trips. A clear window lets you peek inside, and you can label each bag with a dry erase marker. The waste of plastic bags wore Founder Kat Nouri down. She channeled her frustration into creating an eco-friendly alternative—and now those one-use bags are a thing of the past. Dear Grommeteers, We are super excited to share with you the first plastic- and Petroleum-free baggie on the market, the new generation of plastic bags. stasher is not just another reusable bag, it is the only bag on the market that is made entirely of platinum silicone. We are excited to be at the forefront of bringing innovative materials and technology to the market that can have a powerful impact by providing a functional affordable solution that is a healthier choice for people and the planet. It's time to Rethink Plastic! Just pop them in the dishwasher, Kimberly. Can I use these in a Sous Vide? @Mike Doh! If I had read the info box I would have seen that before asking. Exciting! Ha! No worries, always great chatting with you. @Brenda. I was one of our testers for Stasher. Sous vide cooking was one of my favorite uses. How do you wash these? Are they dishwasher-safe, or must they be washed by hand? They are indeed dishwasher-safe, Chris! Is the seal like the ones found on Ziploc bags? Do these bags seal well enough to hold wetter foods or liquids without leaking? E.g watermelon. 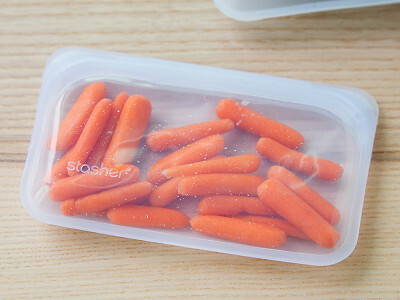 @Danielle You can use Stasher like you use any zip top bag. 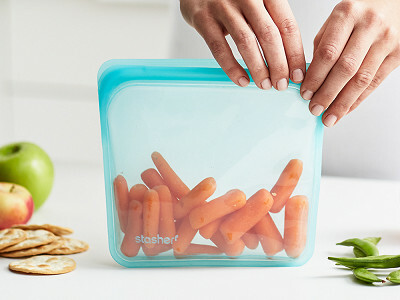 Stasher is best for dry and most foods, but not for storing and carrying your liquids. Just like other zip tops, Stasher is ideal for freezing liquids. You can fill up Stasher, push our excess air, pinch across the top and lean up the bag until liquids are frozen. The beauty of Stasher is when you defrost the content, you can simply throw Stasher in boiling water and melt the content if you are not fond of using a microwave. You can of course put Stasher in the freezer, microwave and the dishwasher. Our silicone's tolerance to the heat and cold is fantastic. @Kat This doesn't really answer the question. Yes or no on the watermelon. "You can use Stasher like you use any zip top bag" and "You can use Stasher like you use any zip top bag" is not the same thing. I use ziptop bags to take watermelon to work all the time, but that is certainly not 'dry' food. For 11 bucks, someone should know what they are getting. Hi Jennifer, Kat mentions below that watermelon is good to go! It is, Neil. You can find rationale for the price and long term benefits for stasher littered throughout the board. How many are included in each order? It does not say on the description. Thanks! Hi Amy, it is one per order. Interesting product. I support the goal of reusable and not disposing all of the plastic, but you will need to get the price way below $11.95 per bag for it to be viable. Also, freezer grade zip locs are perfectly fine for sous-vide cooking so the video is a little misleading. Hi Bill, we appreciate your support of sustainable living. As far as price, see Kat's comment above for the rationale. The main takeaway: higher quality materials will yield a higher price point especially for a young Maker. 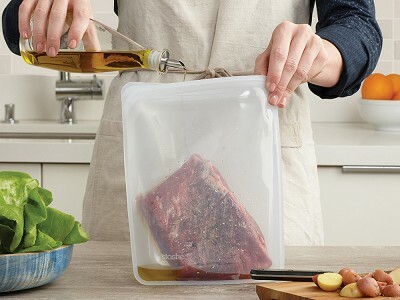 And we didn't mean to imply other bags were incapable of handling sous-vide cooking we simply wanted to highlight the versatile nature of stasher. @Bill Actually I think the jury is still out on that. There's been studies that suggest the materials being used to replace BPA might have the same estrogenic effects as BPA. (See Mother Jones article from a couple years ago if you're curious.) I count myself as part of a growing market for cooking and food-related products that avoid plastics entirely. Well lucky for you, Jerry, this is one of those products. I can't speak to the article, but Kat and co. have invested heavily in making sure stasher is made of safe materials. I might have missed it, but I don't see an answer to Martha's question. Is it one for $11.95? I'd love to have dozens of various sizes but at that price, it isn't going to happen. Hi Whitney, it is one bag for $11.95. Multiple can be bought for $10.95 apiece. So far it is just the 15 fl oz size but keep an eye out because Kat said more sizes are in the works. But I'll wait for the price to come down. Even at the buy two price of 10.95 each is a bit much in my opinion. They need to be more affordable to be an option that I would consider, but that's me and I wish you good luck with your business. Thanks for the kind words, Jeffrey. We totally understand it may be out of the price range for some. But just to put it in context, you'll pay between $6-$9 for 300 or so disposable sandwich baggies. For a few dollars more, you receive a bag you can safely reuse over and over. In the long run, that's saving a lot of waste and dollars. Looking online, I see Ziploc Freezer Bags (quart size) for $2.98 per box of 19 at WalMart. Now if I were to purchase enough Ziploc bags to equal 3000 - 5000 uses, I would need to pay between $470 - $784. Of course the regular, non-freezer sandwich bags would cost less, but one couldn't safely use them to go from freezer to microwave. If I purchased 10 of these Stasher bags, I would still be paying only $219 plus S/H. The savings made by paying for these Stasher bags should be apparent! @Mike One bag that can be used over and over but what if you need 2 or 3 bags at a time or more? It does seen very very pricey. Definitely out of my price range. I'll refer you to the math from our nameless commenter above who compared the cost of Ziploc baggies and 10 stasher bags. I think you'd be surprised by the long term savings. @Mike Long term savings is not always in everyone's budget. Baggies cost a couple bucks a time. If you don't have 100 dollars to spend on silicone baggies right now, it doesn't really matter about the long term savings. I use an embarrassingly large amount of baggies and I don't even spend 100 dollars in a year. Don't get me wrong, I think these are great. But I don't think they are a true substitute for baggies. The 10 stashers was just an example, but I see your point, Jennifer. Thanks for the comment. While the long term value is one of the many aspects that drew us to stasher, we understand and appreciate it isn't in everyone's financial wheelhouse. @Mike I really wish I had a $100 to spend on these! But it is something for me to keep in mind for maybe a single purpose such as a travel/toiletries bag. Also, if the snack size ever gets on the market (and you would hopefully get more little bags for the price) I would love to use these exclusively for my kid's lunch. So, not exactly a true baggie, but definitely useful! Keep an eye out, Jennifer, we are always updating the product offerings of Makers. Your kids will love them. Especially the Characters ones. Is there anywhere it might be stated how many times you can re-use these bags? Even plastic in the microwave wears down after the first few uses. @Jennifer Stasher can be reused 3000+ times. Our silicone is very durable so you can enjoy your stashed for a very long time. @Kat Wow that is great and thank you! How do you thoroughly clean the bags and air them out to dry? 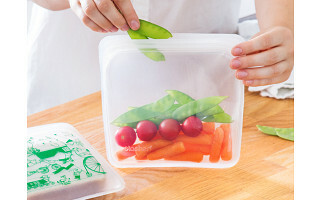 Regular ziploc bags can be turned inside out for washing and air drying. Also, the price needs to come down at least 50% to be viable. You would increase net profits on volume instead of trying to recoup costs immediately. Grommet probably also takes a chunk, which is why so many things are overpriced here. Hi Joe, they can be placed in the dishwasher or washed with soapy water. In terms of price, 100% pure platinum silicone isn't cheap. To come down 50% puts it in line with lesser quality plastic versions. stasher is in a different league. Price is always going to be subjective and never appeases 100% of potential customers. We've gotten a lot of comment recently about things being overpriced here on site. Just to set the record straight, we are selling products at their actual price. If that's out of range, we understand. Not every Grommet will be for everyone. Our financial relationship with a Maker doesn't influence what you or any other community member pays. We are not trying to 'get' you or steal your money. We also don't get much of an assist from flash sites and big box stores online and off that skew the perception of price. We are trying to help these Makers succeed. One of the best ways to do that is to help them sell their product at their actual price not a slashed one. I think Grommet should take a step back and examine their pricing model. Is it not true that if you offer something for $10 and sell 1000 of them, you can make more if you lower the price to $5 and sell 10,000 of them? Let's assume the real cost to produce the product is $1. In the first case you would profit $9000 and the second case you would profit $40,000. Because if you listen to your customers, they are often impressed by a product but it's just out of reach for them. A 10x number of units sold by lowering the price is not unreasonable. I get where you’re coming from, Joe, following a general principle of basic economics. But that doesn’t mean the price stasher came to wasn’t arrived at precisely by what you said. Again, we don’t set prices, our Makers do. And they want to sell as many as they can while making a profit. As we’ve said several times on here today, we fully support stasher. We understand some people won’t see the value at this price, and that many will. I never use the snack size, but I would love the quart size. My husband uses way to many zipper bags. :( Please consider making quart sizes. @suzanne Many sizes will come for a variety of uses. Snack is almost here and gallon is on its way. I am very interested in these bags but the price is way too high, plus shipping? Also - made in China? You never know what you are actually getting. Hi there, in terms of price, there is reasoning throughout this conversation. In this case, you know you are getting a safe, reusable bag that can be put in the microwave, freezer, and dishwasher. Where are these bags manufactured? Hi Russell, stasher bags are manufactured in China. @Russell they are made in China. We have a great relationship with our factory and make sure only highest quality materials are used for stasher. We also pay extra to make sure all of our sources have every testing under the sun and stick to recycled materials or recyclable for packaging. Disregard my last question, I found the answer when clicking on the product link...my bad. Unfortunately, the "Made in China" tag is a deal killer for me. I don't trust Chinese manufactured products that come into contact with my food. We appreciate the comment and you sticking to your shopping values, Russell. @Mike I agree, manufactured in China is a deal breaker for me too. And the belief that a product that comes from there is safe???? And we appreciate you sticking to your shopping values, too, Elise, but it's tough to paint a broad brush that any product manufactured in China isn't safe. Do the multiples need to be of the same color/design to get the reduced price or can I order an assortment? You can mix and match any design your heart desires! Can you turn these inside out so they get thoroughly washed in the dishwasher? Thank you. @Monica You don't need to turn stasher inside out. You can just place it over the plate rack in your dishwasher and it will get cleaned. I absolutely love this concept. Great job Kat! Unfortunately with 7 kids, I have to be mindful of expenses. And I can't justify one bag for that price. Maybe later on make a bulk pack, for discounted rate?! Of course, I see the rationale for price, and if I had the funds I would buy, buy, buy! But as a middle class family, this is a luxury I can't have right now. I'll have to use my washable, cloth baggies, and put the food on a plate to warm up. I sincerely wish you the best, and love this site, and will keep a look out for any coupon codes, discounts for your product. God bless! Dorina, thank you very much for that comment and the words of encouragement. How does the steam vent out during microwaving, to keep the bag from exploding? @Susan You should keep the bag slightly open so steam can get out. Can I use one of these for my carry on liquids when I fly? @Judith Yes, stasher is perfect for traveling. Hi Kat! I LOVE your idea! I plan to buy a couple sandwich size bags, and I am REALLY looking forward to see the gallon sized ones! What have you discovered with these for preventing freezer burn? I have a manual defrost freezer, but would still like to know. @Nichole Thank you so much! I'm glad you like the idea. This is very good question! I haven't seen any freezer burn on food I froze in stasher, but we haven't really tested for it. I love the idea of these bags since I hate the idea of single-use anything like a ziploc disposable. I understand they are dishwasher safe or can be hand washed but do the corners and top closure actually get dry or will they need to be air-dried regardless. Also, are they smell and stain resistant or will they pick up colors and odors of foods placed within. Keep up the fabulous ideas on this site! @Lisa. When I tested Stasher I did need to allow some air dry time after dishwashing. It came out of the machine almost dry-- not dripping wet like my plastic containers tend to be. Hi Elizabeth, yes, 4 for $10 would theoretically make it a better deal, but then it puts stasher in the same league as a regular plastic baggie which it is not. In this case, you are paying for a much higher quality and reusable product. Also, I'm sure manufacturing in the USA was considered by stasher, but as many of our Makers find, opportunities are limited and it is quite expensive. That puts the 4 for $10 bargain even further out of reach. That's not to say it is an impossibility for the future. 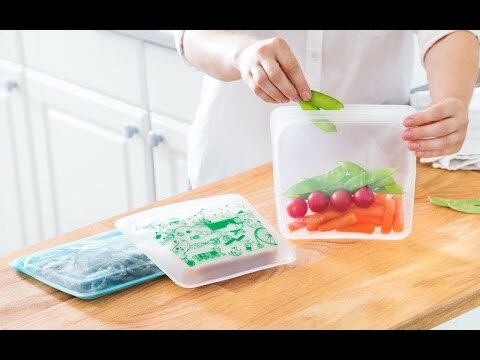 @Mike I bought some Glaslock containers several years ago and converting to glass was so much better than those plastic containers I used to use for veggie snacks. And I was not having to toss and then buy more every few months! I can totally see the value of these! With just the two of us in our home I hand wash but washing the other kind I have learned to air dry and I don't think this will be an issue for me. If I'm in a hurry, I can put them over the vent in the dehydrator or use my blow dryer for a quicker dry. I definitely see the value in them. Next SS check I will buy 2 and then just keep building my supply for my food storage freezer stuff. I think it is a great value and I'm old enough to not be of the instant generation. What is a couple of cups of coffee worth that is consumed and then the container tossed compared to these!! This 62 year old consumer grandma is stoked about these! Meem, it's been quite a day on the board and the .gif below encapsulates my current state perfectly. Oh my gosh, this means I can do boiled baggie omelets without worrying about the chemicals in the plastic breaking down. Will be great for camping. stasher is great for outdoors and camping. You can use it to protect your phone from sand or water and use your phone through the bag! I have read all the questions asked and answers given, but STILL, no answer to whether this bag will carry watermelon without leakage or not. Since you're trying to sell this product, please answer all the questions, otherwise just tell us you don't know! @Kathryn I'm sorry I missed it. Yes, you can definitely use stasher for watermelon or other fruit. The seal is air-tight and won't leak. Please remember to squeeze excess air out before closing the bag. I'd love these but Made in China and the cost to get a set of 5-10 (which is how many ziplocks I routinely use at the same time so would need that many) is a deal killer for me. I appreciate the effort and hope you can do some mass USA marketing. If it was USA at this price, I'd consider it, so I guess it's the China thing that's really the deal killer for me. Do I have to be worried about cross contamination for gluten free like I do with all other plastics? @Barbara You should not need to worry about any cross food contamination with a well washed stasher. Our silicone is hypoallergenic and the non porous nature of silicone makes it easy to clean! After using your stasher, simply wash and reuse. Such a nice alternative, and if they were not made outside of the USA, I'd surely invest a few. Give a shout out if they are ever manufactured here! Will you make new colors and designs in the near future? @Cindy Yes, new designs will be available in September: sandwich size in grey and snack size with 2 beautiful lifestyle prints. We're open for color suggestions so please let us know which color you'd like to see next. @Kat What about 21/2 gallon size? For marinating steaks and poultry for barbecuing? Or for storing larger amounts of food or other items? Something that might be working against you with the cost is that you are only talking about the smallest sizes which makes the cost seem even higher. If you had launched with a full array of sizes, it would have made the it seem more utilitarian and might have created a better sense of perspective regarding the pricing. Hi Snype, from the sound of it, larger sizes are on the way. So keep am eye out for those. You'll find a lot of Makers start off with a smaller initial offering to test the market and gain feedback. In this case, stasher, while only one size, is tackling a pretty sizable problem in eliminating waste from sandwich-sized plastic baggies. Do these have a zipper or only pinch shut? How leakproof is the seal? Let's say you made a batch of something in your crockpot...Can you put a soup or stew in these bags and will the seal hold even if you lay the bags on their sides? Hello again Snype, they seal like a traditional plastic bag but with a much thicker seal. They are not technically leak proof, but you shouldn't have a problem doing what you describe. As long as they are not jostled, they hold liquids well.